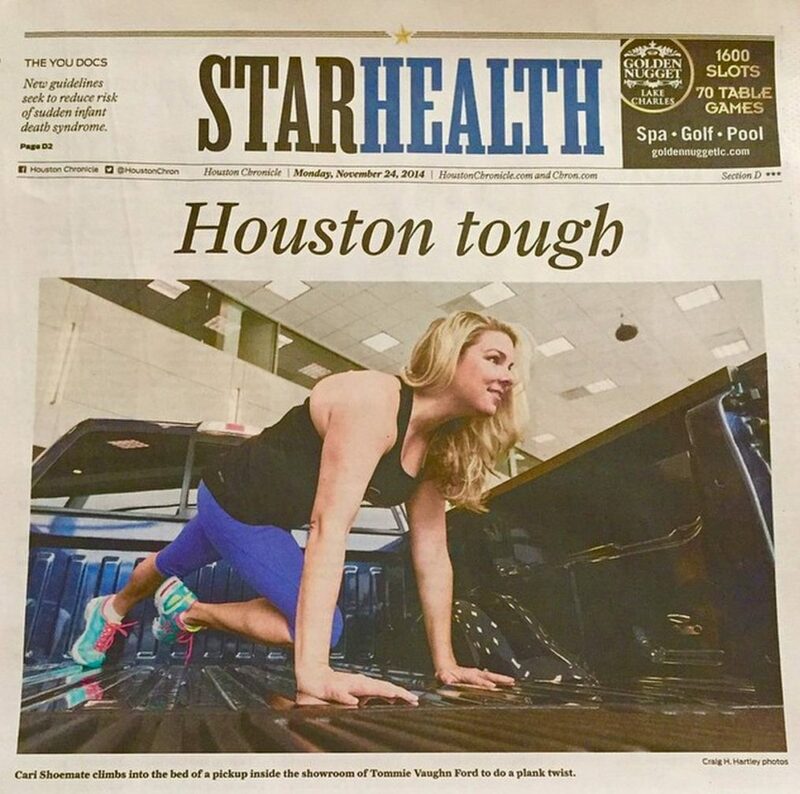 I was featured in the Houston Chronicle this week on the front page of the Health section! Thanks to Joy Sewing who wrote this nice article about my project with Ford! It seems obvious why people drive a Ford F-Series truck. It’s big and can haul a lot of stuff. But fitness expert and trainer Cari Shoemate, co-founder of the Bombshell Bootcamp, hopes working out will be added to the truck’s list of uses. She has created the Ford F-Series Workout that turns the nation’s best-selling vehicle into a mobile gym. Say your chest muscles are soft. Drop down in the truck’s bed for push-ups. Need to build your lower legs? Try calf raises on the running boards. Shoemate recently demonstrated the Ford F-Series exercises at the Tommie Vaughn dealership on North Shepherd. She says it’s a full-body workout, complete with chest presses, squats, plank twists and more, all done in or on the truck. According to Kelley Blue Book, Ford F-Series truck is the best-selling vehicle in the country for 2014, a spot it has dominated for 32 years. It’s also the top seller throughout Texas, which is the world’s biggest truck market. For that reason, the workout is a good fit for the Lone Star State, said Nik Ciccone, Ford Motor Co. communications representative for Houston. Ciccone contacted several area trainers and settled on Shoemate because of her extensive fitness career and her enthusiasm for the project. Shoemate, a native of Brenham, graduated from Texas A&M University with a degree in economics and worked for four years in commercial real estate. She started teaching fitness classes at FIT health club on West Gray and began running marathons. She’s completed six marathons and one ultra marathon of 38 miles. In 2010, she created the video, “Long Lean Legs with Cari Shoemate,” with ExerciseTV, the same company that worked with former “Biggest Loser” trainer Jillian Michaels. 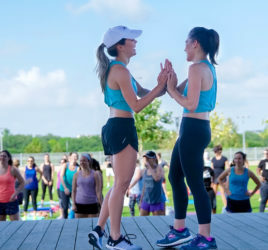 Her Bombshell Bootcamp, operated with partner Carrie Barnhart, is a six-week intense cardio- and strength-training class held Monday, Tuesday and Thursday evenings along Buffalo Bayou. She also trains NBA and NFL cheerleaders. Shoemate demonstrates her two Ford F-Series circuit workouts on her YouTube Channel with videos: “Built Ford Tough Total Body Workout” and “Truckin It Cardio.” She recommends repeating the workout two to three times, totalling 30 minutes, for maximum results. “The only equipment is the truck. So I had to create a workout that is simple and anyone can do when they are at their ranch or out camping or hunting,” she said. Ciccone hopes to spread the word of the Ford F-Series workout through social media and other efforts. “I think it’s a good challenge. It’s a way to mix things up,” he said.